Extreame Savings Item! Save 45% on the Numeric Keypad and Mouse Combo(Enhanced Version), 2.4G Wireless Mini Keyboard and Mouse With USB Receiver(No Device Drivers Needed), 2-in-1 Keyboard Set for Office Laptop Desktop PC Notebook by Vonsen at Pacs BG. MPN: 43210-37674. Hurry! Limited time offer. Offer valid only while supplies last. 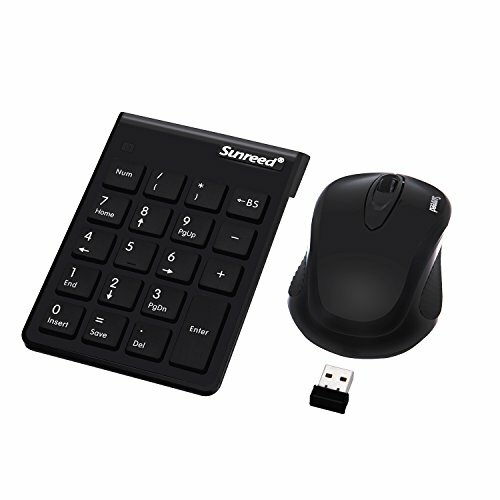 2 in 1 Vonsen numeric keyboard & mouse combos(white) Wireless receiver can match two numeric keypads under the same brand at the same time. Firstly, press the matching code switch until the blue light flashing. Secondly, plug the wireless receiver and press the NUM key on the keypad and the blue light flashing means pairing sucessfully. 1.Pls check whether the battery is installed correctly;or check the battery has power or not. 2.Check whether the code set is successfully. ERGONOMIC DESIGN: Integrated ergonomic tilt provides added comfort which helps prevent wrist strain, suitable for prolonged use, helpful for people working on accounting files spreadsheets, or financial applications. COMFORTABLE TO USE: Full-size 19 keys are very easy and silent to press, convenient to save files with one single key, up to 33FT working range, 10 million strokes times, greatly improve work efficiency. SMART POWER SAVING DESIGN: Auto sleep function, lower power consumption, extend battery life. COMPATIBLE SYSTEM: Works with PC and desktop computers that have Windows XP / VISTA/ WIN7 / WIN8 / WIN10 operating systems.